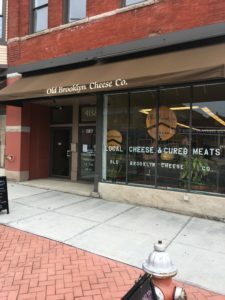 New to the Old Brooklyn neighborhood is Old Brooklyn Cheese Company, owned by Michael Januska. The cheese shop opened only seven months ago. The shop has gained such popularity that Januska is making cheese and charcuterie boards for Cleveland Browns games! Januska’s passion for cheese started when he worked in Covent Garden, London as a chef. On his breaks he would go to Neal’s Yard Dairy, a cheese shop right around the corner. “It was just fascinating, because I didn’t know how to make cheese,” he says. Januska now makes his own cheese right in the shop; 50 pounds of it once a week. The basement of his store includes an aging room, a production room, and a shipping and packaging room. Old Brooklyn Cheese Company sells over 100 different kinds of cheese, including ones they make on-site. The store always has two house-made cheeses at a time. They always carry Treadway Creek and Chupacabra. “Punk” is a rotating cheese, which replicates the taste of chorizo. The Chupacabra cheese is made with Goldhorn Brewery’s Dead Man’s Curve IPA. Januska also uses that beer to make his Spicy IPA Mustard. He already sold over 20 cases of the mustard out of the shop. He chose Old Brooklyn for his cheese shop for a variety of reasons. He knew the layout and demographics. Januska could also see the potential of investing in Old Brooklyn, especially with the handful of other businesses that opened around the area: Randy’s Pickles, Cleveland Kraut, Cleveland Jam, The Sausage Shoppe, and Cake Royale to name a few. 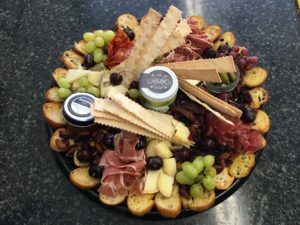 Januska is implementing new ideas for the cheese shop, such as adding panini pressed sandwiches, creating different cheese and charcuterie boards, and hosting more local events. As for the Old Brooklyn Cheese Company, “It’s kind of limitless where we can take it,” Januska says.